The combination of ellipsometry and reflectometry allows for fast and unambiguous determination of the thickness of transparent films by automatic identifcation of the cyclic thickness period. The combination of laser ellipsometer and reflectometry extends the thickness range for transparent films up to 25 µm and more depending on photometer option. The multiple angle manual goniometer with superior performance and angle accuracy allows measuring refractive index, extinction coefficient, and film thickness of single films and layer stacks. The SE 500adv combines ellipsometry and reflectometry to eliminate the ambiguity of measuring layer thickness of transparent films. It extends the measureable thickness to 25 µm. Therefore the SE 500adv extends the capability of the standard laser ellipsometer SE 400adv especially for analyzing thicker films of dielectrics, organic materials, photoresists, silicon, and polysilicon. CER: Combined Ellipsometry and Reflectometry. Consequently, it offers maximum flexibility never reached by standard laser ellipsometers. Operated as ellipsometer, single and multiple angle measurements can be performed. When operated as film thickness probe, the thickness of a transparent or weakly absorbing film is measured under normal incidence. The combination of ellipsometry and reflectometry in the SE 500adv comprises the ellipsometer optics, goniometer, combined reflection measurement head and auto-collimating telescope, sample platform, HeNe laser source, laser light detection unit, and photometer. 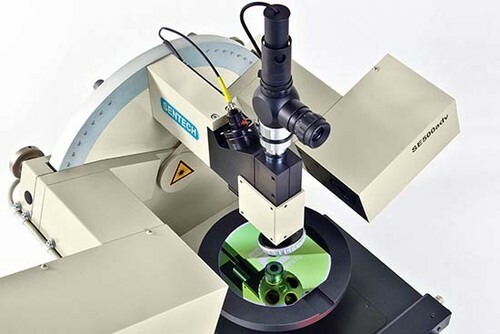 in-situ measurement Video camera Autofocus Motorized goniometer Simulation software Certified standard wafer of the SE 500adv support applications in microelectronics, microsystems technology, display technology, photovoltaics, chemistry, and others. The SE 500advcombines ellipsometry and reflectometry to eliminate the ambiguity of measuring layer thickness of transparent films. It extends the measureable thickness to 25 µm. Therefore the SE 500adv extends the capability of the standard laser ellipsometer SE 400adv especially for analyzing thicker films of dielectrics, organic materials, photoresists, silicon, and polysilicon. The CER ellipsometer SE 500adv comprises the ellipsometer optics, goniometer, combined reflection measurement head and auto-collimating telescope, sample platform, HeNe laser source, laser light detection unit, and photometer.